ABENGOUROU, Ivory Coast—President Alassane Ouattara is trying to restore the economy of the world’s largest cocoa producer, but many farmers here continue to smuggle beans out of the West African country, undermining its recovery from months of brutal civil conflict. In Abengourou, a 90-minute drive from neighboring Ghana, about two dozen trucks depart daily hauling cocoa beans, or what locals call “black gold.” About half the town’s total annual output has been smuggled out since January, traders here said. Ivorian cocoa buyer Maurice Sawadogo said he has been sending his trucks into Ghana because he gets a better price for his beans there and doesn’t have to bribe Ivory Coast soldiers during transport. “Obviously, we didn’t just leave the beans to rot,” he said, pointing to his empty warehouse in Abengourou. Late Wednesday, the new Ivory Coast government approved a 3.05 trillion-CFA-franc ($6.6 billion) budget for the remainder of the year in order to plug holes in the conflict-crippled economy following a five-month postelectoral dispute sparked by the refusal of the then-incumbent president, Laurent Gbagbo, to step down despite losing a November poll. But the bulk of that figure will need to come from foreign aid, in part because cocoa revenues are falling short of targets because of smuggling. Reviving the cocoa industry is seen as crucial if Mr. Ouattara is to eventually wean the country off donor money. Ivory Coast maintains a more-than-370-mile, largely porous, border with Ghana, which farmers, most of whom voted for Mr. Ouattara, exploited after a temporary export embargo he announced in January during the leadership standoff, in which he was internationally recognized as the president-elect. The intention was to squeeze Mr. Gbagbo of revenue and pressure him to step down, but global prices soared to 30-year highs and traders smuggled their supplies out of the country. That has continued even since Mr. Gbagbo’s arrest in April, after which the embargo was lifted. In April, at the height of the standoff, the International Monetary Fund revised 2011 growth projections, saying the country’s economy would contract 7.5%. Before the postelection fighting started in December, the IMF had predicted 4% growth. Ivorian officials are scrambling to stanch the flow of cocoa leaving the country. “We are waiting for vital reforms to be announced, but it all depends on decisions from politicians,” said an official with Ivory Coast’s cocoa exchange, the Bourse du Café et Cacao, which is partly controlled by the government. Exporters have been slow to abandon profitable smuggling deals since the embargo was lifted in April. One reason, merchants said, is that the battered country’s banking system has been slow to process payments. Another, they said, is that pro-Gbagbo militias still operate in the heart of the cocoa belt, interfering with the transport of beans to ports. In addition, exporters said pro-Ouattara soldiers demand bribes of as much as $600 per truck to navigate makeshift roadblocks. As a result, only a handful of boats have docked at the normally bustling Abidjan and San Pedro ports since the embargo lifted. The government has declined to say how big a dent the smuggling has made in official revenue, and has declined to comment on the bribery allegations. Meanwhile, Ghana, the world’s second-biggest grower, is projecting its highest harvest on record. Output for the season ending in October is projected to rise 30% to 825,000 metric tons, according to the International Cocoa Organization, which groups producing and consuming countries. But Ghana cocoa officials deny the increase is linked to smuggling. “An insignificant amount of cocoa has been brought into the country from Cote d’Ivoire, but this has been impounded,” said Tony Fofie, chairman of Ghana’s Cocoa Board. He said higher government purchase prices and improved rainfall helped Ghana dramatically increase production. As part of new World Bank reforms linked to loans, President Ouattara, a former deputy director at the International Monetary Fund, is expected to overhaul the industry with a return to centrally fixed prices. He has discussed guaranteeing an amount paid to buyers for their beans set at 50% of the global price. In 1999, the government scrapped price controls at the behest of the World Bank. The World Bank has also urged a reduction in government taxes, which weigh on the price merchants pay growers. Meanwhile, Ghana’s prices—set at the beginning of each season—remain high, drawing smugglers. Once trucks reach Ghana, workers such as Matthew Kofi help offload them and pay for the beans in cash. “We are all cashing in. This year is the best in a long time,” Mr. Kofi said from the village of Abro-Namoue. Ivorian farmers, meanwhile, said they hope the government can tackle the industry’s problems before a new harvest begins in October. A billboard at the entrance of Abengourou shows a cocoa farmer, machete in hand, standing before an endless field of cocoa trees. 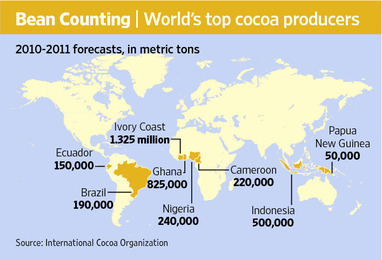 “No work is too great for cocoa producers,” it says.